Have just returned from a really enjoyable holiday in Tenerife. We booked through Holidays4u. Karen Durant was really helpful throughout the booking process. The apartment itself was clean on arrival. We asked for extra towels, which Karen arranged for us through the owner. Can recommend the Altamira complex. But ask for an apartment on a high floor with pool view. Our apartment was on the 5th floor and had brilliant views of both the pool and sea. The balcony was a great place to sit out on of an evening with a gin and tonic! Will definitely return. I have vistied Altimera now seven times, I love the situation of Altimera, part hotel and part private apartments right next to the sea, and the beautiful shops near the Del Duque. Its quiet at night with a few bars and excellent restaurants but if you want the discos and night life you can jump in a Taxi for five euros and go to Las Americas, its the best of both worlds. Absolutely Ideal for families, plenty of sunbeds by the pool, and easy enough if part of the family prefers the sea, so some of us sat by the pool and the rest of the party went into the sea. Most of the apartments are studios or one bedrooms, the only downfall was that because its 20 years old the building. I then totally renovated it, new kitchen, bathroom, newly tiled walls and floor with full airconditioning so now I am lucky enough to have the great service from the staff , the great location and very very comfortable surroundings in the apartment. I am also considering renting it out when I am not there. Anybody wanting to visit Altimera at Adeje I am sure will not be disappointed - Good Holidaying. This was the first time that we had travelled with anything other than a package deal! any concerns we had soon disappeared when we arrived at the hotel! The staff on reception, in particularly 'Lino' were most helpful. the hotel was exceptionally clean and tidy. The hotel was situated on the outskirts of Costa Adeje - a fair walk if you have young children from the centre where all the bars and restaurants were. having eaten in the centre on the first night I found the onsite restaurant to be a little more pricey. Across the road from the hotel was a pizzeria and down the steps was a bar/restaurant that was of excellent value. We didn't see anything in the form of entertainment while we were there so i cannot comment on that but despite that I would definitely go back to the place again. In fact we are planning a second trip for after christmas! 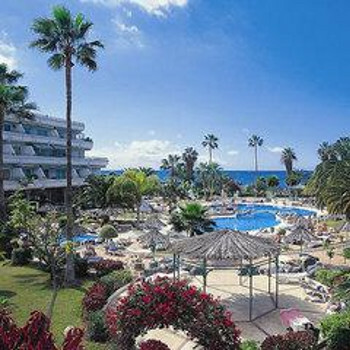 Altamira is basic clean self catering apartments for people who make their own entertainment as I do having visited Tenerife 10 times. The room is spacious enough and the balcony was great - loads of space for the 3 of us at the same time. Great views over to La Gomera although the sun in the late afternoon is incredibly hot facing the balcony. The on site restaurant is great value and surprisingly excellent quality too. Often the accompanying restaurant throw out a buffet style menu and leave it there. This food was cooked a la carte and was of the highest standard. The obscene heat this time meant i did not eat as often as i would normally have done but the La Goscheca restaurant is worth a visit even if you dont stay in the Hotel. The pool side snack bar is just that - perfectly adequate and the Pizzeria near to the reception is above average. The staff in reception were very helpful more than usual and spoke immaculate english at all times. The location is fine for people who don't mind walking a little - it is a good 15 minutes to Fanabe beach and a good deal more to the centre of town but my 18 year old son never stopped moaning and spent more money on taxis than on his plane fare!!!! !